Baxter, Stephen. 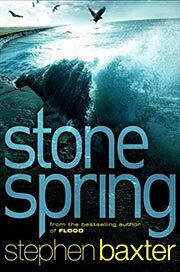 Stone Spring . Gollancz 2011. What if: The Doggerland shallows were not submerged by the rising of the North Sea at the end of the last ice age. 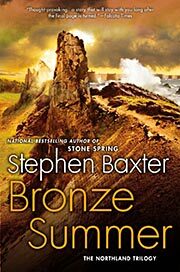 Series note: Trilogy including Stone Spring , Bronze Summer , and Iron Winter . Summary: The inhabitants of Doggerland realize that the sea is rising and begin construction of a great wall to keep out its waters. Series note: First volume of Northland. Published: Gollancz 2010 (0575089180w88 android, 0575089199BUY), 2011 (0575089202BUY); and NAL/ROC 2011 (0451464184BUY), 2012 (045146446XBUY). Baxter, Stephen. Bronze Summer . Gollancz 2011. Baxter, Stephen. Bronze Summer . NAL/ROC 2012. 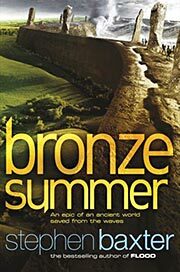 Summary: Millennia later, the inhabitants of Doggerland come into conflict with the survivors of Troy and with the Hittie empire. Series note: Second volume of Northland. Published: Gollancz 2011 (0575089229w88 androidBUY, 0575089237BUY), 2012 (0575089245BUY); and NAL/ROC 2012 (0451464796w88 androidBUY), 2014 (0451419197BUY). Baxter, Stephen. 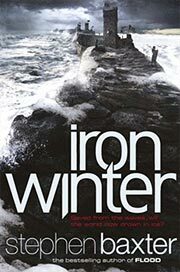 Iron Winter . Gollancz 2012. Summary: A new ice age begins. Series note: Third volume of Northland. Published: Gollancz 2012 (0575089261w88 androidBUY, 0575089288BUY), 2013 (0575089296BUY); and NAL/ROC 2013 (045124012XBUY).